This is a .pdf crochet pattern, written in standard American crochet terms for Poochey and Fudge. 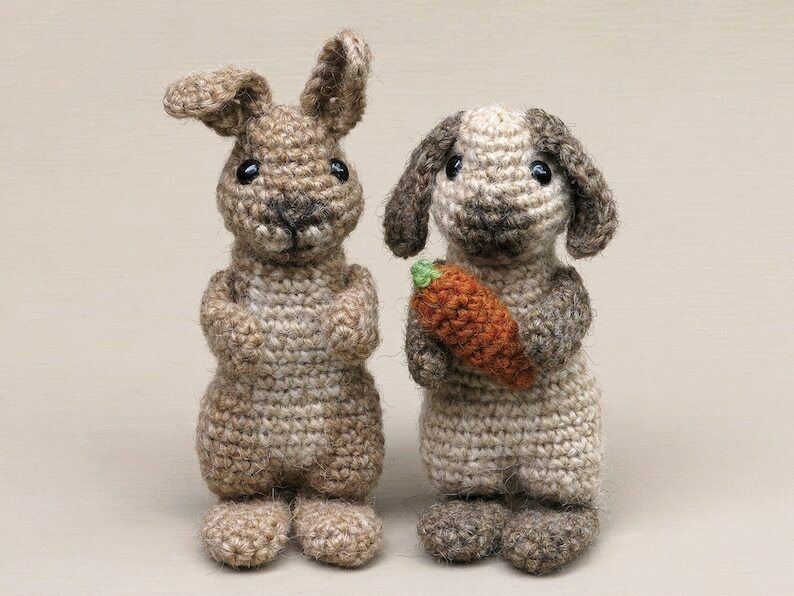 With this easy and very detailed pattern, you can make two super cute crochet rabbits. A lop rabbit and a normal bunny, which is also very suitable as Easter bunny. Size of finished rabbits: If you use the recommended yarn, Poochey will be 7 inch / 17 cm high and Fudge 6 inch / 15 cm. An intro with useful info. List of materials, tools and accessories needed. Brand and colour numbers of the needed yarn. A clear and colour coded description of how to crochet and assemble the animal. Pictures and illustrations to help getting everything right. This crochet pattern is available for Instant Download. When your payment is completed you will receive an email with all the information needed to download your file. This email will be sent to the email address registered with your Etsy Account. Thank you for the good pattern! Was the hardest thing I've ever crocheted, but I finished it, and it's adorable! The patterns are very understandable, and the animals are so cute. You'll be so proud to have your own. 4 for 3 pattern pack! Crochet animal / amigurumi patterns, buy 3 get one free. Of all the hundreds of alligator patterns I scanned, this guy’s size and face are just right. Because the items you can buy in my shop are digital items only, I can't give you a refund, because the information already is send. When you are not happy with your purchase, do contact me and I'll see what is possible. If you have questions or need any help, also please let me know before leaving feedback, I'm always available to help.